Crochet vest styled jackets are one of the most fashionable addition to your outfit during spring and summer days. 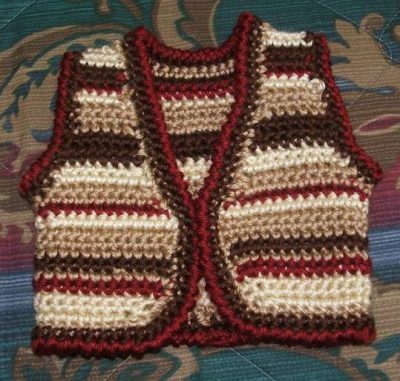 You can make your own crocheted vests in cool colors for babies, men, and women too. They look chic when teamed with denim or skirts. You can opt to make the front-open ones or the pullover kinds. 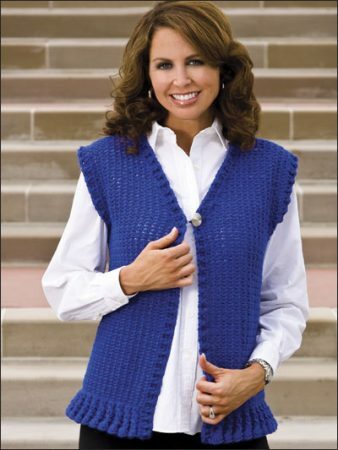 Crochet vest shrugs are sleeveless and go well with formal and informal attire. 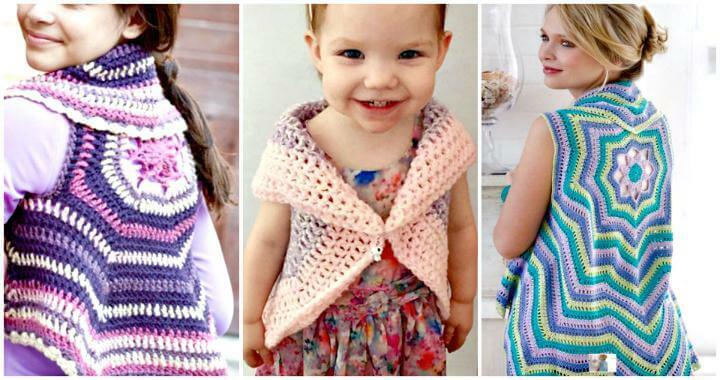 Check out the various crochet vest patterns listed below with free step-by-step instructions and diagram. We have compiled some of the best tutorials for skilled, intermediate and beginners crocheters. Time to use your stashed up yarn. You can use cotton or woolen ones. The cotton yarn will make it more wearable even in the summer days. Make sure you use some enchanting colored yarn which makes it perfect for girls to wear during springs. Get the complete pattern with instructions in the linked tutorial. 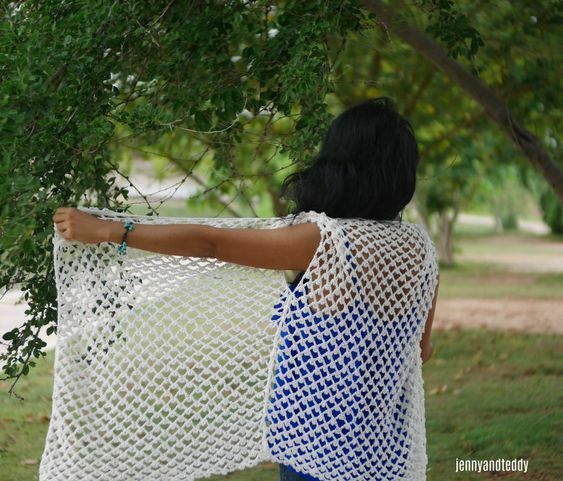 Make your own Bohemian crochet vest for your summer beach vacation. The long duster pattern adds a modern chic touch to your summer wardrobe. Get the step-by-step instructions with PDF pattern on hopefulhoney. Crocheting a Mandala design is a trendy way to sport colorful patterns of your crocheted masterpieces. The technique though not for beginners but surely give you a stylish outlook. 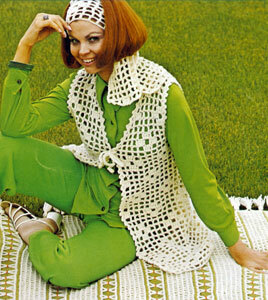 The granny square is one of the most popular among crocheters. This is a front closed, tight-fitted design which is a refreshing addition to your attire. You can make this pattern for both men and women. Young girls can use this as a cool crochet crop top vest. 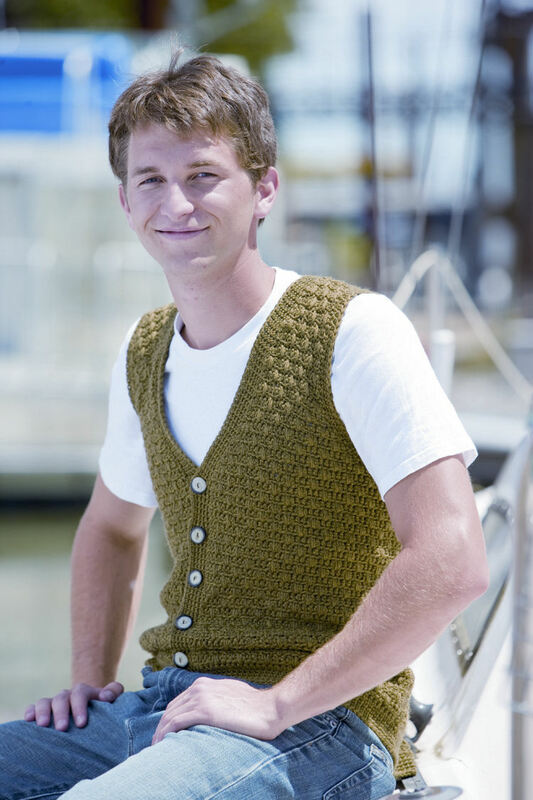 This cute retro vest pattern is the right addition to your summer look. The sleeveless jacket can be worn on beaches on a warm day. You can also try black and other colored yarn for this design if you want to wear this in winters. Get ready with your hooks and cotton yarn to make your own lacy crocheted vest. The lace crochet stitch technique will add a cool and airy touch to the design making it ideal for the summer days. Adding a soft neutral color can help tone down a bold pattern. This V neck vest is great for toddlers. You can make this in pink or purple yarn and add a small bow for your baby girl. Looking for some urban cool gypsy vest pattern? Then this hippie styled vest is the perfect pick for the hot days. This is quite an easy pattern for a beginners crochet project. You can always choose to decorate it further with small pom poms or buttons, beads once you master the basic pattern. This simple yet sober red crocheted vest with a V neck is easy to make for beginners too. This pattern is made with worsted yarn and is ideal to keep you warm on a cool breezy day. 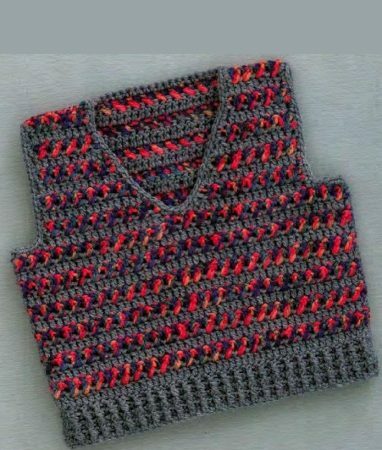 You can use a singled color yarn as in this pattern or multi-colored to add some element to the sleeveless sweater. 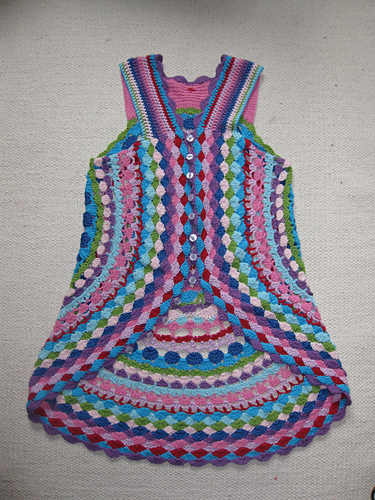 The crochet vest is created using regular crochet stitches, created by Kim Guzman. This sleeveless jacket is ideal for all seasons, matching well formal and informal shirts. 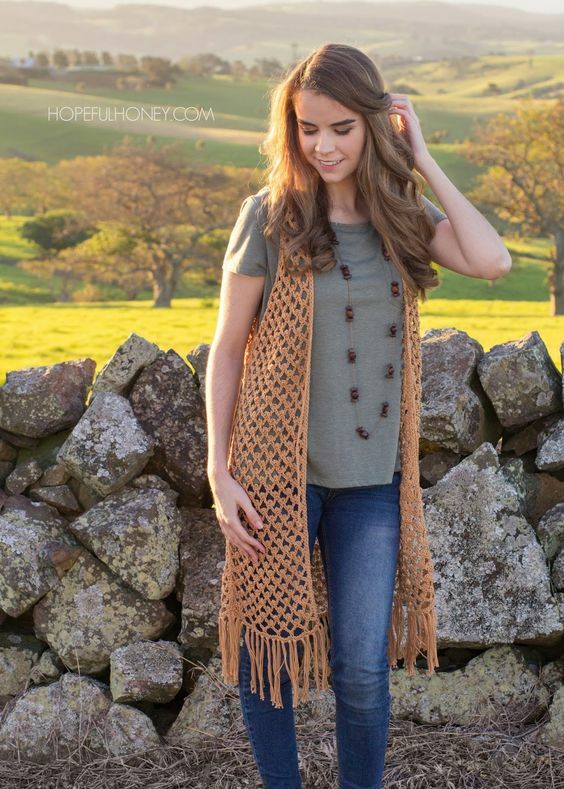 This rippling crochet vest looks absolutely stunning with this falling collar style. The use of subtle colors give it an edge and makes it look great on sleeveless tops teamed with denim. The small circular motifs made in the lace vest goes well with all kind of outfits. Play with the yarn colors to sport a vibrant look for the spring. The lacey effect gives it an elegant finesse making it ideal for evening wear. You can try different sizes depending on who you want to make this for.